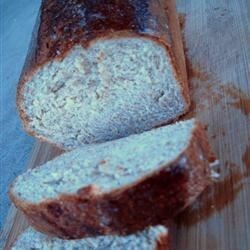 "A tasty, nourishing whole wheat bread that's easy to make." In a small mixing bowl, dissolve the sugar and yeast in warm water. Let stand until creamy, about 10 minutes. In a large mixing bowl, combine the yeast mixture with the milk, vegetable oil, whole wheat flour, 1 cup of the all-purpose flour and the salt; beat well. Add the remaining flour, 1/2 cup at a time, stirring well after each addition. When the dough has pulled together, turn it out onto a lightly floured surface and knead until smooth and elastic, about 10 minutes. Oil a large bowl, place the dough in the bowl and turn to coat with oil. Cover with a damp cloth and let rise in a warm place until doubled in volume, about 1 hour. Grease two 8x4 inch bread pans. Deflate the dough and turn it out onto a lightly floured surface. Divide the dough into two equal pieces and form into loaves. Place the loaves into the pans. Cover with a damp cloth and let rise until doubled in volume, about 40 minutes. Meanwhile, preheat oven to 400 degrees F (200 degrees C). Brush the risen loafs with lightly beaten egg. Bake at 400 degrees F (200 degrees C) for 30 minutes, or until the bottom of the loaf sounds hollow when tapped. the only problem I have is that this is not a whole wheat recipe. Whole wheat= all whole wheat flour, thus whole. So besides not being what it says, it's a good "Wheat bread" recipe. This recepie was pretty good. I made an additon to the recipe. I added 2 tablespoons of honey. It was not too sweet. It just added a little more flavor. Thanks for the recipe!